The NASCAR Hall of Fame, which opened last month in Uptown Charlotte, yesterday launched the Ultimate Fan Experience Tour. The daylong tour begins with admittance to the hall then takes guests to several Charlotte-area NASCAR race shops and attractions. 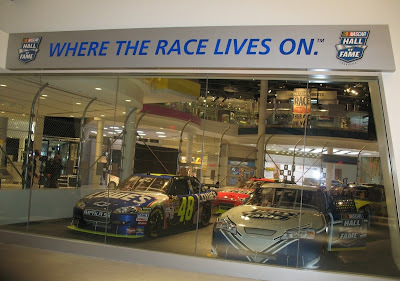 During the tour, you're given three hours to explore the 40,000 square feet of exhibit space of the $200 million NASCAR Hall of Fame, which includes more than 50 interactive stations, iRacing simulators, authentic artifacts, historic stock cars, and more. This portion of the tour concludes with a catered lunch served in a souvenir lunch bag. You'll continue the tour with an afternoon of behind-the-scenes visits to a variety of local race attractions. Tour itineraries vary but include stops such as Charlotte Motor Speedway, Sam Bass Gallery, Hendrick Motorsports, Earnhardt Ganassi Racing, Dale Earnhardt Inc., Curb Motorsports Museum, MacDonald Racing, and Michael Waltrip Racing. Guests are treated to tours of race shops including areas not generally viewed by the public, access to personal work spaces, opportunities to view collections of selected celebrities, live pit stops, and discounts on race merchandise. The Ultimate Fan Experience Tour is all-inclusive and costs $99 for adults, $89 for children ages five-12; children four and younger are free. Tours pick up Monday through Thursday at 8:45 a.m. at Concord Mills Mall or 9:15 a.m. at the NASCAR Hall of Fame. Seats are filled on a first-come, first-serve basis. Click here to book a tour.